At St. Barnabas, we recognize that young children gradually grow in readiness for schooling. Curiosity makes them eager to know and learn, and their exploration of the world raises many questions! As they learn about themselves and their surroundings, as well as God's gifts, they develop a caring attitude towards others. With that in mind, we offer flexible Preschool programs for children ages 3 and 4, as well as a fulltime Pre-Kindergarten program for children ages 4 and 5. 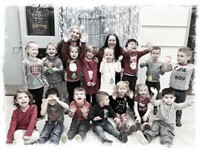 Our curriculum, established by the State of Ohio and Diocese of Cleveland, is developed within an active learning environment with an emphasis on religious experiences, language arts, reading and math readiness instruction, fine and gross motor development, problem solving and positive social behavior. Our Preschool and Pre-K environments provide all the ingredients for learning along with support from a team of highly qualified teachers, assistant teachers and administration. Preschool 3s: Our Preschool 3s program is Tuesdays and Thursdays, with a morning session 8:00 AM – 10:30 AM, or an afternoon session 12:00 PM – 2:30 PM. Students must be 3 years old by August 1 and toilet trained. Preschool 4s: Our Preschool 4s program is Mondays, Wednesdays and Fridays, with a morning session 8:00 AM – 10:30 AM, or an afternoon session 12:00 PM – 2:30 PM. Students must be 4 years old by August 1. Pre-Kindergarten: Our Pre-Kindergarten program is Monday – Friday; 8:00 AM – 2:30 PM. Pre-K Students participate in all specials to include: PE, Art, Music, Computer, Library and STEM (Science, Technology, Engineering and Math). They also participate lunch with their teachers and weekly Mass. Students must be 4 years old by August 1. Students must be 4 years old by August 1. New for Fall 2019 St. Barnabas is introducing "Wrap Around School Services" to Preschool and Pre-K children. We will be offering extended day care in an early childhood setting from 7:00 AM- 6:00 PM , M - F following the school schedule, as well as speech and language services. The "wrap around" label refers to the fact that the services are intended to wrap....the settings of home, school and community. It is family centered and in support of working parents. Want to experience St. Barnabas first-hand? Check out our Visit St. Barnabas page to learn more about tours, shadow experiences and upcoming open houses. You can also view what is currently going on in our preschool classes but checking out our Parent Preschool page. If you have questions or would like to get more information about our Preschool program, please complete our online Request Information Form or contact our Admissions Department at (330) 467-7921 or email admissions@barnabasohio.org.